Are Daily Forklift Inspections Required? Does your forklift get inspected on a daily basis? It should. According to the U.S. Occupational Safety and Health Administration (OSHA), all forklifts should be part of a regular maintenance program. Part of this maintenance involves daily inspections. If your lift currently doesn’t receive daily inspections, you should notify your supervisor immediately. The absence of a forklift maintenance plan and daily forklift inspections could mean huge penalties and fines down the line. We know all about the importance of having a forklift daily checklist. Our training modules cover all of the required OSHA regulations, including rules involving forklift maintenance. If you aren’t quite up to speed with your forklift safety, or you need a refresher with the most complete training online, sign up today. We’ll get you on the fast track to OSHA compliance. And that’s great news for you and your employer. 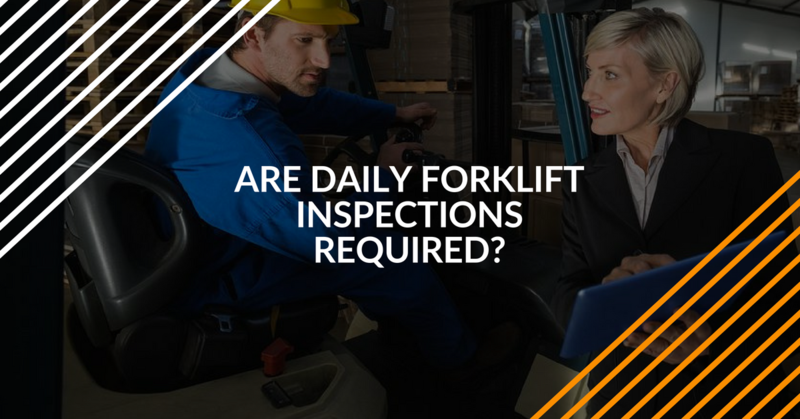 Let’s review some important aspects of daily forklift inspections, and also look at how a forklift inspection checklist is one of the best things your company can do for forklift safety and OSHA compliance. Industrial trucks shall be examined before being placed in service, and shall not be placed in service if the examination shows any condition adversely affecting the safety of the vehicle. Such examination shall be made at least daily. Where industrial trucks are used on a round-the-clock basis, they shall be examined after each shift. Defects, when found, shall be immediately reported and corrected. Forklifts that aren’t given much maintenance attention are more likely to fail while in operation. That’s the main driving force behind 29 CFR 1910.178 (q) (7) and many other OSHA rules and regulations. Safety devices like finger guards, decals, etc. We also created a helpful forklift inspection checklist. This informative infographic will help you and your maintenance personnel ensure every forklift is working properly and is ready to perform as intended. For more information, be sure to check out our daily forklift inspection infographic. From the visual pre-check to operational inspections, this will help ensure everything on your forklift gets inspected prior to use. You can also print out copies for co-workers, safety supervisors, and anyone else involved with forklift safety! In addition to our own infographic, OSHA also published a valuable online resource, Sample Daily Checklists for Powered Industrial Trucks, which contains a thorough forklift inspection checklist for maintenance personnel and forklift drivers. This checklist ties in directly to 29 CFR 1910.178 (q) (7), and is recommended as a go-to reference check for any forklift maintenance crew. With our online knowledge base and OSHA-provided guidelines, you can improve your daily forklift inspection right away! But remember, nothing beats forklift certification – and our training is a great way to obtain OSHA compliance easily and affordably! There are many reasons that OSHA requires daily forklift inspections. A forklift inspection checklist will help prevent accidents, and it also helps set safety standards for your entire company. And remember – OSHA requires lift inspections every day. A forklift daily checklist is a great way to keep on track with OSHA compliance, your company’s safety plan, and – most importantly – promote a safer, more productive work environment. Train a Trainer – helps anyone become a Certified Forklift Safety Expert. Training Kit – a great resource that covers a wide range of OSHA forklift safety topics, including daily forklift inspections! Bundle Package – get both packages listed above for one great price! Sign up today and enjoy all the benefits that come with OSHA compliance. For individual forklift drivers, our certification means better job opportunities, and a thorough understanding of OSHA forklift safety requirements. For companies, our training not only stresses the importance of things like daily forklift inspections, but it also provides extra peace of mind during OSHA audits, accidents, and more! Thanks for visiting FLC – and best of luck with your daily forklift inspections! If you have any questions, feel free to give us a call at (888) 278-8896.